Hello, everyone! It's Broni here with you today to show you what I created for this month's ePlay Challenge: Fall. I decided to go with one of the first techniques I learned way back when I first started stamping. Before the days of alcohol markers. First I used my TCW Mini Onion Skin 6x6 stencil and my ink applicator to apply some Lettuce alcohol ink to my background panel. 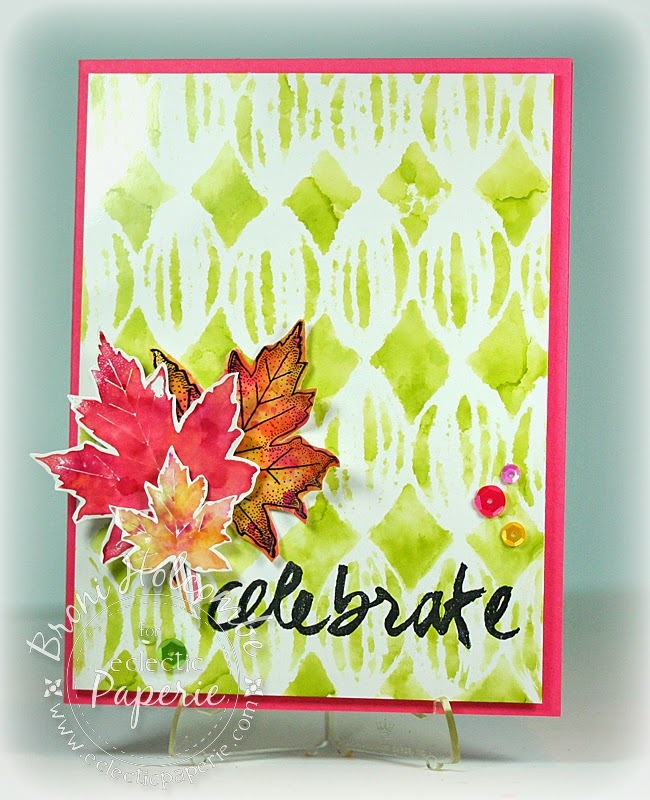 Then I applied some Cranberry and Butterscotch inks to my applicator with a little bit of the blending solution and dabbed it directly onto my solid maple leaf stamp and stamped it onto some more glossy paper. I then proceeded to use a different applicator pad for each of my combination of inks. (Colors: Cranberry, Butterscotch, Lettuce, Wild Plum) Each time I applied a new color combo some of the dried color from the previous application to the stamp was reactivated. This resulted in many different varieties of color combinations. Kind of what you'd actually find in autumn leaves! I found that I couldn't stop myself! I ended up with many, many leaves to use on future projects! I really love the ones on which you can see the veins! Finally I used each of the previously used pads and coated some more glossy paper allowing all the colors to blend together. I stamped my maple leaf outline stamp in Ranger Archival Jet Black ink several times. Then I cut out a few of my favorite leaves and added them to my card front along with a simple sentiment and some sequins. And that's it! Pretty simple, but that's how I've been rolling lately. I love the clean fresh look of this card! Who says autumn colors have to be deep and dark?? Now it's your turn. Let's see what you come up with for the ePlay challenge!! I can't wait! I just adore the pseudo water color technique here. Such gorgeous leaves! May have to try this one out. Love that onion skin stencil background Broni! and your leaves are so pretty in the alcohol inks!! wow, did not know about using alcohol ink on stamps. LOVE how this turned out. Absolutely gorgeous. LOVE your background, Broni, and the vibrant colors you used! Gorgeous card! Beautiful leaves!